Calculates the form factor for a polydisperse population of spheres with uniform scattering length density. The distribution of radii is a rectangular (box) distribution. 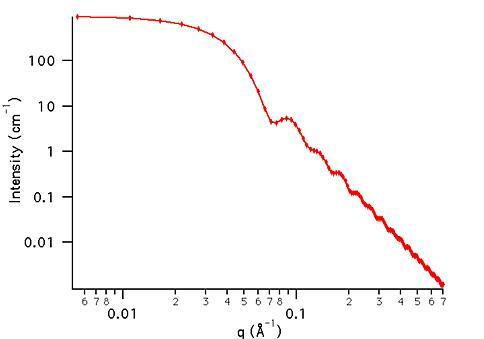 The form factor is normalized by the average particle volume such that P(q) = scale*<f*f>/Vol + bkg, where f is the single particle scattering amplitude and the < > denote an average over the size distribution. The returned value is scaled to units of [cm-1], absolute scale. with the constraint that w <= R. Here R is the average radius specified by parameter above. R is the mean of the distribution and w is the half-width. The root mean square deviation is . The polydispersity, . This example dataset is produced by calculating the PolyRectSphere using 128 data points, qmin = 0.001 Å-1, qmax = 0.7 Å-1 and the above default parameter values.